Why is megohmmeter testing strongly recommended for Schluter®-DITRA-HEAT-E-HK heating cables? The insulation resistance test is intended to detect very small breaks throughout the cable insulation before, during, and after installation. These breaks often remain undetected during the continuity test since they are not necessarily short circuits between the conductor and the ground braid. Even though they are small, these breaks can cause a current leakage to ground. Such a leakage is usually detected by the mandatory ground-fault circuit interrupter "GFCI" (thermostat with integrated GFCI or panel mount GFCI). When a current leakage is detected, the GFCI trips the circuit, thus disabling the floor heating system. A megohmmeter (sometimes referred to as a "megger") is a special type of ohmmeter, which supplies high voltage to measure the electrical resistance of insulators. An ordinary ohmmeter or multi-meter is not capable of producing the required voltage and therefore cannot be used to perform this test. We recommend that you purchase or rent a megohmmeter before beginning your project or hire a qualified electrician to perform the test. Please refer to the Schluter®-DITRA-HEAT Installation Handbook for more information regarding the heating cable insulation resistance test method and other heating cable tests. If the insulation resistance test is completed, along with the other tests, and the heating cable tests log is submitted, the system warranty coverage will be extended by 5 years for a total of 15 years. All heating cable test results must be recorded in the heating cable tests log in the DITRA-HEAT Installation Guide and a copy of the log submitted with the warranty registration card (by mail or via www.schluter.com/registerwarranty) for warranty purposes. Installation related damages are not covered under warranty. 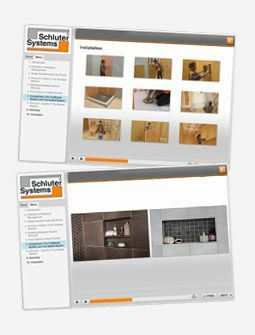 For further warranty information, the complete Schluter®-DITRA-HEAT and Schluter®-DITRA-HEAT-TB 10-Year Limited Warranty, including coverage, conditions, disclaimers, etc. may be accessed on our website.